John Bitzer ’74 and his dad stand together as Chiefs during an event. John Bitzer ’74, no stranger to U of I, Collinsville, Illinois, resident and son, father, and uncle to Beta can trace his Illinois passion through his entire family. 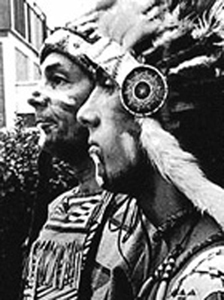 His father, Robert, was the Chief from 1945 to 1946. From Robert’s 1947 Illinois-UCLA Rose Bowl game and parade performance to the yearly Illini football and basketball games with his son, the younger Bitzer always had the Chief spirit coursing through his veins. After finishing his senior year, John’s determination led him to contact then Marching Illini director Everett Kissinger, and he competed against 30 other hopefuls and ultimately secured the Chief position. For four years, his exhilarating performances would be treasured by tens of thousands of children, alumni, and spectators as well as the student body who never diverted their attention from him. His routine—which included an homage to that of his father—was so unforgettable that it even remained unchanged for 15 years after his graduation. Recounting his experiences, he vividly recalls a Dad’s Day performance with his father showcasing both men’s individual Chief routines, and a game his senior year where the crowd “just went wild” as he caught the band off guard by stepping onto the field to perform in a torrential downpour. Aside from being Chief, John’s Beta experience was equally important. His upbringing made him favor Beta and he knew several actives when rushing, but the idea of carrying on his father’s tradition was the motivation that made Beta Theta Pi his second home. The friendship and fidelity he desired has lasted through his lifetime ever since and fostered a closeness with his brothers and own son, Robert, University of Iowa ’17, whom just as his father did for him, he pinned for initiation at the Alpha Beta Chapter. As his role came to a close, John taught his methods to another round of hopefuls. One student then stood out among the rest. His name was Michael Gonzalez ’77. The decision to attend U of I always made sense to Michael Gonzalez ’77, a central Illinois native with aspirations of joining the financial industry. But when one weekend visit during the spring of his high school senior year introduced him to the Sigma Rho Chapter, little did he know he would be beginning a journey that would initiate him into Beta Theta Pi, take him around the globe, and forever cement his name as the Chief of 1974-76. Michael Gonzalez ’77 leads the parade on foot and is the symbol for the university. “It was a pretty simple decision to join Beta; I met the guys that weekend and never stepped foot in another fraternity after,” he says proudly. And before he knew it, he was moved into the house with the pledge class, taking part in traditional Saturday morning clean-ups, and enjoying all the advantages that came with brotherhood. Thoroughly enjoying this newfound freedom, Michael was then presented with the customary Sigma Rho competition that pitted him against his pledge brothers to dance as the Chief. The weeks withered away and his fellow brothers were eliminated one by one until he was the last man standing. Originally thinking it was just a pre-initiation formality, he actually caught the eye of John Bitzer ’74. former Chiefs on the tradition’s 50th anniversary at Memorial Stadium and even the honor of meeting Lester Leutwiler—the Chief who started it all. When reminiscing of his undergraduate years, Michael also loved that he was able to establish lifelong connections, develop skills and confidence, and meet his wife—to whom he has been married for 36 years—through Beta Theta Pi. But just as John passed the honor of Chief onto him, he would do the same once introduced to Matt Gawne ’80. 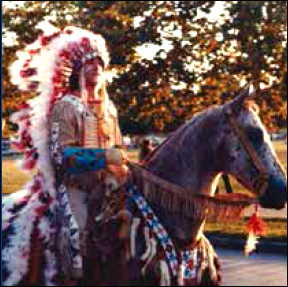 Matthew Gawne ’80 leads the parade on the chief ’s horse during the annual Homecoming parade. His father, two brothers, nephews, and cousins (and later his daughter) all attended the U of I. The Cincinnati resident and Oak Park native by serving as Chief from 1977-1979 didn’t realize he would take his family’s 30-year Illinois history several steps further. Looking for a place where he could be surrounded by a smart, competitive, and fun group of guys, he knew Beta Theta Pi was a clear choice as soon as he met the actives. Once initiated, attaining the role as Chief was next. Acting in one of the greatest and most humbling roles of his life, Matt traveled the U.S. for three years inspiring future Illini fans, speaking at dozens of children’s and alumni events, and even performing at Soldier Field, the Pontiac Silver Dome, and Madison Square Garden. He experienced firsthand the passion alumni and students had for the tradition and developed critical leadership skills along the way, not knowing they would later prove useful while serving as Sigma Rho’s chapter president. Just like John and Michael, Matt also too feels admiration and happiness that the Beta house will be alive once more and that all can now return home. After all, Beta’s influence on campus didn’t end with a decade of Chiefs or a campus suspension; it has always existed, ready to pick up where it left off.